Recently I came across a new language named 'Julia'. It is a dynamic language meant for technical and scientific computing. It is very fast for a dynamic language, approaching speeds of lower level languages like C. The language and work environment is well documented at the site. 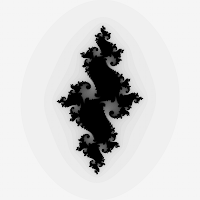 I am just starting to explore and this is my first program using Julia: generating "Julia Set Fractals" using Julia! The program is very simple, since Julia has complex numbers already available in the language. The program prints the image out in PGM format which is a simple grayscale ASCII format. PGM files can be viewed with OpenOffice or Gimp.